Remodeling of extracellular matrix is crucial for many physiological (cell migration, proliferation, growth, and development) and pathological (remodeling of heart, carcinogenesis, metastasis, etc.) events. Thus, the interaction between cells and extracellular matrix plays a key role in normal development and differentiation of organism and many pathological states as well. Changes in extracellular matrix are regulated by a system of proteolytic enzymes that are responsible for proteolysis of huge quantity of extracellular matrix components. Matrix metalloproteinases (MMPs) represent the main group of regulating proteases in ECM. 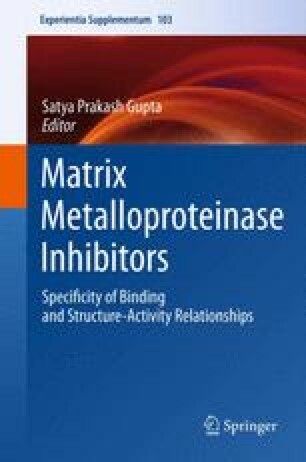 Ability of matrix metalloproteinases to modify the structural integrity of tissues is essential for certain aspects of normal physiology and pathology. The ability to process molecules such as growth factors, receptors, adhesion molecules, other proteinases, and proteinase inhibitors makes MMPs potent controllers of physiological and pathological events in the cell microenvironment. Overactivation of MMPs has been implicated in numerous disease states.